Crate Paper, K and Co goodies, Martha Stewart punch. Taking the doodling class has been a great way of getting doodling, drawing and adding hand made elements to my pages.On this one I expressed myself a little more freely (ie: didn't use a printer) on my journalling block. It's not "professional" like computer journalling but it does add a little zip. Do you think Boy scrapbook pages are harder to make than girl pages? I do. Girl pages with their lace, scallops, glitter and butterflies almost always look awesome. Boy pages, especially for older boys always take a lot more effort and don't have that "cute" factor to rely on. This post is another addition for my What Do Vegans Eat file. Gauche Alchemy is one of the coolest companies I know. 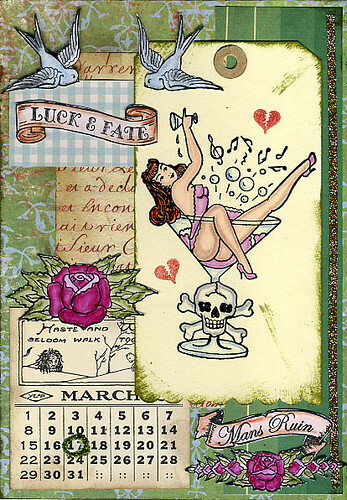 They sell paper crafting/collage kits and one even included one of my favorite Bombshell Stamps ever. See... told you they are way cool. You can see their shop here and their blog is a constant source of inspiration. To top all that, Amy the owner is just about the nicest person you'll ever meet so you can feel good about sending business her way. My mind is buzzing with all the cool projects I want to make. If you are the kind of person (like me) who sorts your stash by color, these little baggies of joy are an incredible purchase. It's like having a super-cool personal shopper. And at four bucks, you can't go wrong. Funny story, when the parcel arrived my DH and boys all came running because I was squealing with joy. The boys were at least as enthusiastic as I was and tried to spirit off several of the cooler game pieces and patches. Chris came into the room and said, " You bought bags of crap???" and wandered off. Now the boys keep referring to my treasures as the "Red BoC" or "Orange BoC" which sends them into fits of laughter. P.S. I'm not affiliated with Gauche Alchemy in any way. I just think they're a very gush-worthy company. I have the best father in law in the whole world. He is creative, fun-loving, generous and more a father to me than any of the three dads I had growing up. The last year and a half have been hard for him and he's been an incredible example of how to be noble and others oriented even when your own life is turned upside down. Dad, I love you dearly. Seldom a day goes by that Chris, the kids or I don't say, " Gee, Dad/Grandpa would really enjoy this. I wish he was here." We like big signs and shameless public celebrating so BIG , BIG signs are often incorporated in our festivities. I would really appreciate some prayer and positive thoughts. My bone disease has been bad and all that has kept me from going to the hospital has been how rampant H1N1 is here in our county (8 dead out of the 44 nationally, most this past week). Yesterday while watching movies with my sick boys I spent some time working on a page of doodles as my warm-up project. It was done balancing paper on my knee so there are some wonky bits. But it's a doodle, not a drawing so I'm happy with it. Do any of you remember filling pages with doodles in high school during boring classes? Making this page brought back a lot of fun memories. After I was done I decided to color it. I used everything on this page - copics, water based markers, colored sharpies, pencil crayons... I thought it was a great opportunity to see what ran and what pens played nice. The finished page is less than perfect but I'm happy with all the discoveries I made. The boys haven't seen a full page of doodles before and it really inspired them to make their own. I hope they take the time to sit down and make one. I'd love to see what cool things their little minds come up with. We were in San Francisco all last week (I had set my blog to post while I was gone) and now that we're back I'm totally knackered. Sick kids, sick me... blah. Speaking of oodles, I'm taking the Oodles of Doodles class at Get it Scrapped. The Oodles link is to a free warm-up lesson. It's very fun - your kids will like it too - and I'd love to have some of you as classmates. With all my complaining about Utah, I thought it due time to show you why we love it so much. 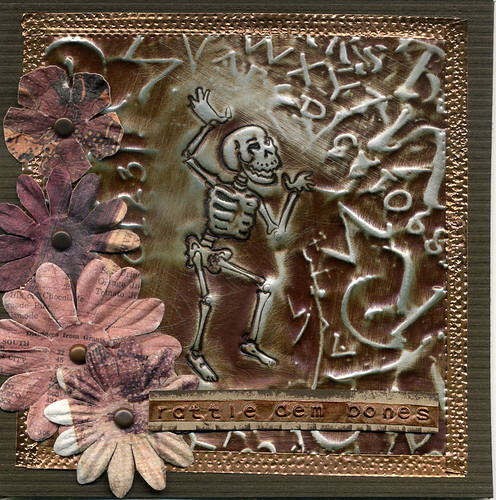 I used one of the digital stamps from the monsters collection (scroll to the bottom of the page) and paper and stickers from Sassafras Lass. By the way, any day where I get to use googly eyes is a great day indeed. Did you see that Victoria Case has a new free image available - and it's awesome! Check it out here. 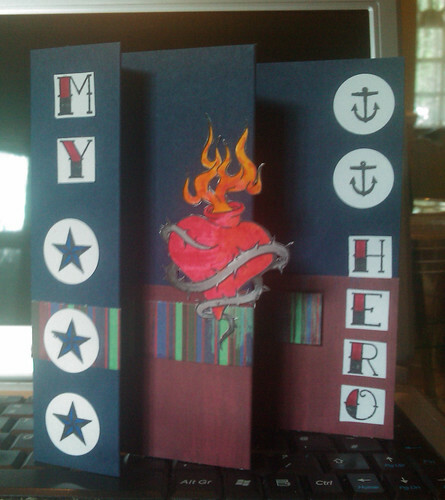 Here's a couple more TSR Guest Designer projects. I really enjoyed working with the grey paper. It just added a sense of occasion and elegance to everything. I'm planning to use a lot more grey in the future. This is my absolute favorite scrapbooking "cheat". I learned it from the estimable Brenda Carpenter and I use it all the time. Many of my pages have bare backsides. *giggle* Seriously. I realized I didn't have any more orange paper for matting or journal strips so after (I do not advise this) I'd attached it, so I more or less ripped out the middle next to where I had glued it down. Messy but if you look at the complete LO above you can see how much paper I salvaged. This technique has allowed me to use my paper to it's maximum potential. Next I painted the cardboard with blue and green paint and set it aside to dry. I have been making a lot of cards lately and my little trash bucket was running over with trimmings. 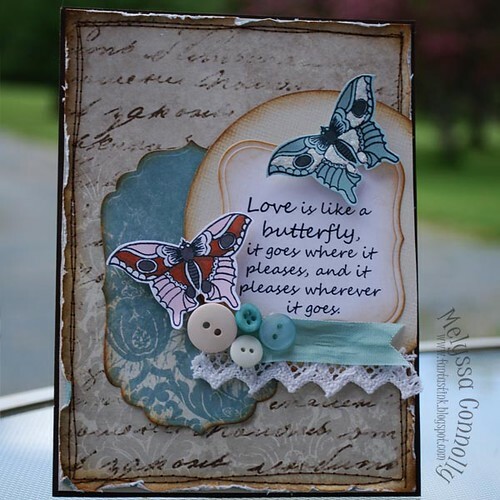 I was able to make all the stamped details on this layout with discarded bits or the back of smudged stamp-failures. The paper, ribbon etc. were all bits left over from other projects. I colored in several of the grid squares to match the stamps. All in all it was a tremendously fun endeavor. And in keeping with my theme, this project met with my commitment to contribute a recycled cardboard project for the Green Team Scrapbooking and Paper Crafting Friends (great site, go join ) and to try my hand at using stamps on a LO - a tutorial hosted by Glittery Katie, Miss June, at the Bombshell Stamps Paper Craft Planet Group. 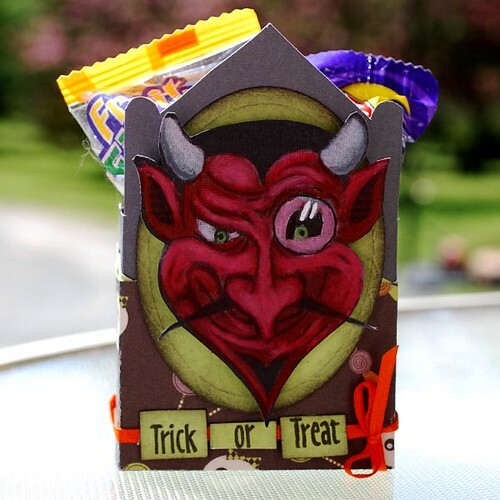 If you haven't got involved yet at Paper Craft Planet you should scamper over there and sign up. The place is RAD! Stamps: Bombshell Stamps. orange flowers from Bombshell Angel, Bird, Til Death and flower in photo corner from the retired "Til Death set. P.S. You know how I did the red, white and blue card yesterday for Kathi's challenge? I forgot to mention that you don't need to use Bombshell Stamps. You can use whatever you have... I'm not even sure you have to use stamps at all. I can ask her. So if not having any Bombshells is keeping you from playing along; don't let it.